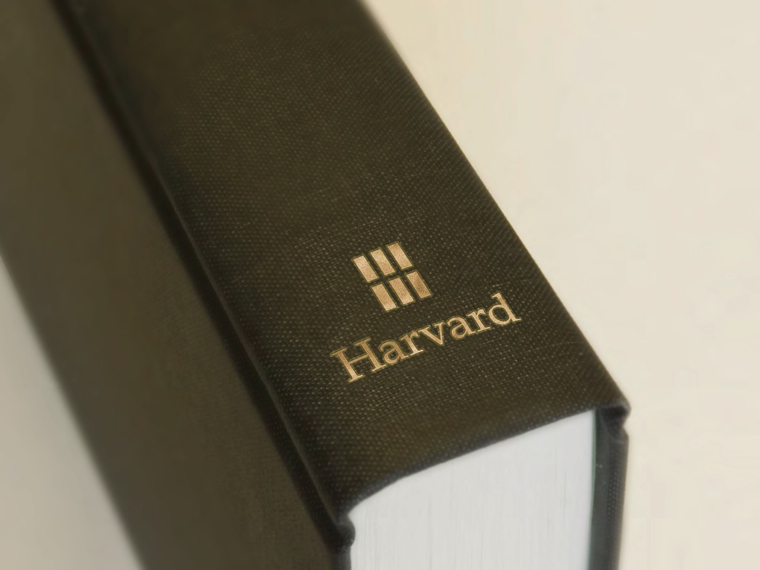 For a hundred years, Harvard University Press appears to have had no logo it could call its own. When a designer fashioned a title page for a book, or stamping for its spine, or a catalog of forthcoming books, or a flyer promoting them, he or she appears to have turned to the type-specimen book of the Printing Office (the office itself closed in 2002) and used one of scores of Harvard shields found there. Sometimes indecision seized the designer, and one shield appeared on the spine and a different one on the title page. Shown here is a small sampling of the shields that have adorned Press publications. Sometime in the mid 1970s, the use of shields became infrequent, and a simple "Harvard" appeared on book spines, in this typeface or that. To help mark its centennial, the Press has adopted a new, cohesive visual identity. The logo takes the form of two vertical rows of three crimson rectangles, with the letter H visible in the negative space between the six rectangles. Sagi Haviv, partner at the design firm Chermayeff & Geismar, which worked with the Press to create the new look, said that it will be well suited for a variety of uses: "The new identity is simple enough that it will be effective both in traditional applications, such as book spines and title pages, and also in digital media such as app icons, browser icons, and e-books."